APC Smart-UPS SURTD3000XLI - 3000VA Rackmount UPS Uninterruptible Power Supply. Tested in full working order, has some scratches (Please see pictures). 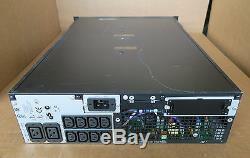 Supplied with rails and bezel & AP9631 Network card. 1 x APC Smart-UPS SURTD3000XLI - 3000VA Rackmount UPS Uninterruptible Power Supply. 1 x Set of rails. The APC SURTD3000Xli supplies utility powers to the connected loads in the event of a UPS overload condition or fault. It allows additional run time to be quickly added as needed. It maximizes battery performance, life, and reliability through intelligent, precision charging. It ensures clean, uninterrupted power to protected equipment while batteries are being replaced. It automatically starts up the connected equipment upon the return of utility power. It also prolongs battery life by regulating the charge voltage according to battery temperature. InfraStruXure Manager Compatible: Enables centralized management via the APC InfraStruXure® Manager. SmartSlot: Customize UPS capabilities with management cards. LED status indicators: Quickly understand unit and power status with visual indicators. Serial Connectivity: Provides management of the UPS via a serial port. Rack/Tower convertible: Protects the initial investment in the UPS when migrating from tower to rack-mount environment. Flash upgradeable firmware: Install maintenance releases of firmware remotely using FTP. User-replaceable batteries: Increases availability by allowing a trained user to perform upgrades and replacements of the batteries reducing Mean Time to Repair (MTTR). Automatic self-test: Periodic battery self-test ensures early detection of a battery that needs to be replaced. Predictive failure notification: Provides early-warning fault analysis ensuring proactive component replacement. Disconnected battery notification: Warns when a battery is not available to provide backup power. Audible alarms: Provides notification of changing utility power and UPS conditions. Frequency and voltage regulation: Gives higher application availability by correcting poor frequency and voltage conditions without using the battery. Power conditioning: Protects connected loads from surges, spikes, lightning, and other power disturbances. Input power factor correction: Minimizes installation costs by enabling the use of smaller generators and cabling. Generator compatible: Ensures clean, uninterrupted power to protected equipment when generator power is used. Cold-start capable: Provides temporary battery power when the utility power is out. Resettable circuit breaker: Easy recovery from overloads; no need to replace a fuse. Safety-agency approved: Ensures the product has been tested and approved to work safely with the connected service provider equipment and within the specified environment. UL, FCC, CE, C-Tick approvals. Output Power Connectors (Battery Backup). (8) IEC 320 C13, (2) IEC 320 C19, (3) IEC Jumpers, British BS1363A, IEC-320 C20, Schuko CEE 7/EU1-16P. Output Power Connectors (Surge Protection). Typical Backup Time (Half Load). Typical Backup Time (Full Load). 130 x 432 x 660 mm (WxHxD). VAT IS NOT PAYABLE BY PURCHASERS OUTSIDE THE European Union (EU) AND by purchasers in the EU (excluding UK)who are VAT registered. Please call freephone 0800 328 4995 or from outside the UK +44 7725 301 888. The item "APC Smart-UPS SURTD3000XLI 3000VA Rackmount UPS Uninterruptible Power Supply" is in sale since Saturday, August 20, 2016. This item is in the category "Computers/Tablets & Networking\Power Protection, Distribution\Uninterruptible Power Supplies".